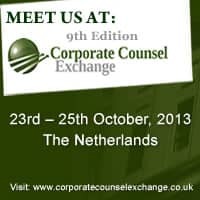 Pamir Law Group will be sponsoring the 9th Corporate Counsel Exchange meeting in the Netherlands on October 23 – 25, 2013. The 9th Corporate Counsel Exchange offers a platform for senior legal professionals to network, debate and develop effective business strategies. This exclusive, invitation only event tackles the challenges that heads of legal face today and offers new solutions through a series of case studies, panel discussions, interactive roundtables and pre-arranged, one-on-one meetings with a range of solution providers and outside counsel.